It's not that I don't like Halloween, though it's not my favorite holiday. But lately I've felt that the other fall holiday has been unceremoniously pushed aside. Ornaments next to costumes. Candy buckets on the same aisle as tree stands. Thanksgiving has somehow been relegated to one day of gluttony and sports. Last year, in an attempt to put more focus on thankfulness, the kids and I made a paper chain and leaf banner for the breakfast nook and tied the words of Psalm 100:4--"Give thanks to Him and praise His name"--to it with twine. Very cute. We did a tree craft with foamy leaves and card stock and wrote things we were thankful for on each of the leaves. I wanted the changing seasonal decor to be intentional. This year, after browsing through the PBKids catalog, I recreated their Tree of Thanks calendar (maybe not quite as fancy, but definitely cheaper--if I don't count man-hours). And with help from my co-conspirator in all things kids & crafty, Kellye, we focused the activity on praising and thanking the One who gives all things. Each day, the kids will pull a card from the pocket, read the Scripture or prompt, and respond by writing their answers on the cards. My hope is that we can begin a tradition and, more importantly, foster a mindset of thankfulness. Even if you don't have a tree, maybe you can start a tradition of 30 days of thanks in your home. Leave a comment and tell me about a Thanksgiving tradition you have found helpful! 13. My favorite toy is… Thank you for good gifts & fun things! 26. Psalm 105: 1-4, God, I’m thankful for your wonderful act of…. We're just about at that point, six weeks in. The point where "they" say things should be settling in, you should be figuring things out, things should be running smoother. And, well, they are. I'm happy to report that the kindergartner and the preschooler love school, we have routines, we have tricks that get us through the week, we've made adjustments, figured out what works and what doesn't. Not that everything always runs smoothly as this morning's rush to the minivan, shoes in hand, proves. But we arrived, on time, calmed down by Indelible Grace music and a bit of prayer. Things I like: a four-day school week, homework that is over by 10 AM so we can go to the children's museum, uniforms, doing science experiments in our kitchen, having mommy school with Ben (right now he's made rockets out of the pattern blocks we created), having one-to-one or one-to-two ratios, not having to create lesson plans, getting to expand on lessons and challenge R as needed, seeing Rebekah smile as she comes out to afternoon car line, hearing good reports from teachers (Rebekah is sweet and a good friend; Ben is smart and answers questions! ), having great teachers that love my kids. Things I don't like: William's lack of regular napping, being in the car a lot, keeping up with paperwork, cranky or overly silly homework times, early alarm clocks, neglecting William (poor third kid), not being all together all the time, finding time for everything. All in all, I'm happy with this school model. Sometimes I feel like she doesn't get to do as much fun stuff at school, but that also means I get to do the fun stuff with her. Which also means I need to create fun stuff for us to do and not get caught up in running errands or housecleaning, though at times this is important too. (Finish math work and then dust!) And we'll have a class play date this week--how great is that? I'm trying to claim Fridays as family days, which is hard. Stuff just gets in the way and I can get so lazy. This Friday I hope to play at the park as the weather is just gorgeous and do an activity for our current fruit of the Spirit lesson--LOVE. Well, the girl's school looks nothing like that, but she will be at her first day of kindergarten at Legacy Preparatory Christian Academy. LPCA is a university-model school. Students go to school two to three days a week for instruction and do the rest of their school work, review, practice, pre-reading, projects, at home. Our school room is ready. Map, calendar, magnet board hung up. Supplies in the cute little caddy (I love Lakeshore!! I could get in lots of budget trouble there.) Rebekah's work for the week is clipped together (if you can see the purple glittery flower clip) and hung on the magnet board. The teacher posts the week's assignments on RenWeb for parents to download. This week we have projects for writing the letter T and doing T sounds, a texture collage to make, some art and some math. Right now, sounds very do-able. Ben is ready for more this year so I thought we would work on a few sight words at a time which I also have on the magnet board. I know he and I have more than a few letters to review and do some fun stuff with. What is this, you ask? An alphabet box. Each drawer of this box (available at Lowe's) has tiny objects that begin with that letter. Here's "T" (so far): treasure, television, table, tiger, ticket, and turtle. I was pressured--;) just kidding!--into this project by the alpha-crazed Kellye--she of three boys and infinite energy (you can read their alphabet summer adventures, more about the alphabet box, and raising Christ-centered kids whose roots run deep here). There are several games to play like I Spy and Common Bond. I'm interested in building Ben's ear for phonics and these small manipulatives are great for his fine-motor skills, especially once I find the kind of tongs I'd like for him to use in this and other activities. I'm still searching for many objects for the less common letters. Trips to Michaels and Hobby Lobby are like treasure hunts--stickers, buttons, erasers. And I've made some objects--a puffy paint web, an apron from fabric and ribbon scraps. I'm ready to really get going on it and incorporating it into our mommy school. I may need to have a Dead Poets moment for myself and rip out the remaining worksheets from Ben's workbook....nah! Bring on the seat work!! On a Thursday evening, I drove by our mailbox before attempting a bookstore and dinner date with my lovelies (at our favorite chicken establishment, of course). D was out of town and we were approaching the end of a tiring but highly enjoyable week of VBS and the end of a tiring and emotionally draining month in general. 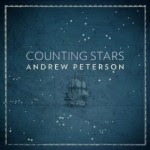 To my delight, a padded envelope bearing a Rabbit Room mailing label awaited us--the new release from Andrew Peterson, Counting Stars. I put the CD in, handed the liner notes to the girl (she is so my daughter! ), and enjoyed words and music washing over our car as the rain fell softly and the children quieted down. This is maybe AP's most family-oriented album with songs for and about his wife, children, their home--The Warren, and his ancestors. The album's title is an allusion to God asking Abraham if he can count the stars and the legacy one man can have. "Dancing in the Minefields" was the first song that got me all mushy, especially as D and I approach our tenth anniversary. We married young too (22 and 21) and have been sailing in the storms through it all: "And it was harder than we dreamed but I believe that's what the promise is for." You can also watch a music video here--see You Tube is good for something. And while several songs are about his own family, there are words to our extended family in Christ: to plant trees that will live on after we are gone, to remember we are priests and princes in the Kingdom of God, and to not let go because there is hope in the night. This is a raw, honest, and mature album. Every song is true, poignant, and lovingly crafted. I can't wait to see some of these songs performed at the Behold the Lamb of God concert this winter (December 17th for you Houstonians!). I will be bringing tissues for sure. it helps to have made baguettes in the morning (when you are up at 6 AM because you smell something really funky in the kitchen garbage and you can't sleep another minute). And to let a precocious one year-old play with anything that won't kill him. That usually means the plasticware cabinet...and apparently shoes. And to make a chocolate cake that starts with a mix (to which you add sour cream, pudding, chocolate chips, and pecans among other things) and becomes a warm, gooey, moist yumminess which your precious daughter will pronounce the best cake she's ever eaten. And you eat said cake dreaming of a machine that folds laundry while giving you a pedicure and rubbing your shoulders. Tomatoes: This is the first year I've actually gotten tomatoes from plants planted in my yard. (I have two Romas, one grape, one patio, and one beefsteak). There are few things more satisfying than picking a sun-warmed tomato from the backyard and eating it (drizzled with olive oil and sprinkled with kosher salt, cracked pepper, and torn basil) within minutes. Ben has declared that he likes tomatoes from our garden. I just have to convince him that all tomatoes come from some garden, some where. Blackberries: Truthfully, I didn't even like blackberries that much. Until. This year the kids and I picked blackberries from a "farm" a stone's throw from our neighborhood. Baked into a cobbler the next day and topped with Brenham's own Blue Bell Homemade Vanilla--I'm a believer. WOW! Blueberries: The kids enthusiasm quickly wilted in the morning sun (it was only 80 at 9:00! ); we managed to pick a paltry pound of blueberries before William's cries for a nap sent us home. They did perk up for blueberry pancakes for lunch! Cookies: Okay, no local ingredients but aren't they adorable! I baked them for William's birthday this past weekend along with a Texas sheet cake for the adults. Living outside of Florida for the first time in my life, this is my place to share, connect, and express. And to shamelessly post pictures of my three adorable children.